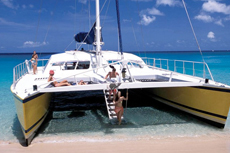 Board a luxury catamaran and enjoy a relaxing day boating around the scenic island of Barbados. Top notch service and the ship! The catamaran tour was very good as was the whole atmosphere on the boat. The catamaran tour was very good as was the whole atmosphere on the boat. It was great fun. Lots of rum and a beautiful lobster lunch. Two great beaches where the water was warm and lovely to swim in. This was a great excursion!! Entire day was wonderful from start-to-finish. Entire day was wonderful from start-to-finish. The catamaran was very spacious with lots of room to move about. The crew was very attentive. The lunch provided was super...the best I&apos;ve ever had on similar excursions. One of the best excursions on the cruise. We went on Tiami for a sail cat tour - about 6 hours in total. We went on the Miami Five Star Catamaran & Turtles snorkeling adventure. This catamaran experience was amazing. This catamaran experience was amazing. Only 12 people on the vessel. Crew was exceptional. This was the highlight of the trip. Perfect day! 12 adults on a beautiful 62 foot catamaran (we chose no kids tour), fantastic snacks/meal and a premium open bar from moment we boarded. 3 crew members and Captain took care of our every need. Five Star Catamaran and Turtle excursion was awesome! Five Star Catamaran and Turtle excursion was awesome! The crew is the best! We saw sea turtles, cruised a bit, and then had beach time. Best excursion! This was a great tour and the staff was excellent. This was an exceptional sailing and snorkeling tour, complete with lunch and beverages. Our whole family loved this trip. The catamaran excursion was great. The catamaran excursion was great. Food and drinks included were good. Beautiful beach. Swam w/ the turtles but we only saw 2 turtles unfortunately. Couldn&apos;t have had a better time! This was a highlight of our vacation. This was a highlight of our vacation. Beautiful catamaran that we actually sailed on with great food and beverages. Nice snorkeling and swimming. The service was excellent. Beautiful luxury catamaran with only 12 guests, great service & food. We went on the Moon Dance. We went on the Moon Dance. It was a luxury Catamaran. Great top notch service! This was the best tour! Though we don’t scuba we really enjoyed the excursion. Our 6th time out with Calabaza, they never disappoint, snorkeling and great food and drink! Our 6th time out with Calabaza, they never disappoint, snorkeling and great food and drink! Pickup provided by taxi as part of the excursion.